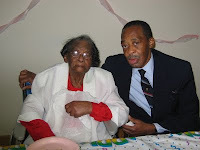 Other than my mother and brother, these are the two people I love the most in the world; my great-grandmother and my grandfather. My great-grandmother died about 5 years ago. My grandfather lives in a home in North Carolina now. Ever since I've moved out to Cali, I haven't been able to see him because when I go to the East Coast, I don't have the time or money to go to NC. His birthday was October 2nd. I've always said that if I were to kill someone, my granddad would help me hide the body, no questions. Some of my favorite memories are of the little, green house in Hertford, North Carolina. They say you can never go home, but I go home all the time. The place I can't go is back there because my grandma and granddad aren't there anymore. I wrote this poem the first time I went back to that house after my great-grandfather (Granddaddy Bud) died.